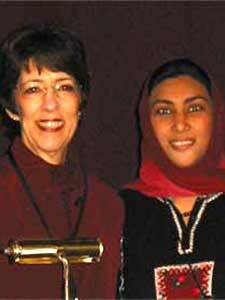 The Arabian Reading Association (TARA) Conference celebrated its 10th anniversary March 2-4, 2005, when 425 educators gathered in Bahrain at the Crowne Plaza to attend, A Decade of Dedication to Literacy. TARA, which is a non-profit organization, was conceived and founded in 1994 by a group of Saudi Aramco educators seeking to provide a forum for meaningful professional development in literacy education for the Gulf region. 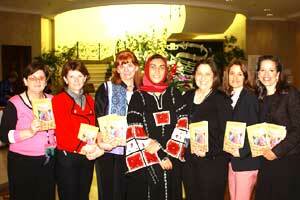 The organization is a national affiliate of the International Reading Association (IRA). This year, delegates hailed from 10 countries in the Gulf region, and participants represented over 25 different nationalities. The international array of people was bonded by their love of learning and quest to discover more about the latest methods and strategies of teaching reading and writing. The pre-conference was held on Wednesday, March 2, offering a choice of five different full-day workshops, including sessions in English and in Arabic. On Thursday morning when the general conference began, the center was bustling with activity as people registered, greeting each other warmly over coffee and tea, and sharing stories from the past year. Excitement filled the air as participants previewed the program, which carefully described each workshop or presentation that would be offered over the next two days. Presenters came from schools located in Abu Dhabi, Bahrain, Hong Kong, Italy, Jordan, Lebanon and Saudi Arabia. Over 40 presentations were offered, some in Arabic and others in English, ranging from how to include technology in teaching reading, how to implement a school-wide developmental literacy program using continuums, strategies for effective reading instruction and how to teach phonemic awareness and measure fluency, among many others. The opening session on Thursday featured welcoming remarks by the conference committee chairperson, Maggie Mutsch, followed by George Farag, Cultural Attaché, US Embassy, Bahrain, and comments by Sheikha Lulwa Khalifa Al-Khalifa, Director of Curricula, Bahrain Ministry of Education. Then two special guests of TARA this year, both delegates from Afghanistan, spoke about education and literacy in their country. In a heartfelt speech, Gul Gotai explained that under the Taliban, females were not allowed to be educated, so that has left a void in the number of trained female teachers. Although there are new training centers for teachers, the demand far exceeds the supply. Both delegates asked the audience for help, not only through financial means, but also through volunteerism. 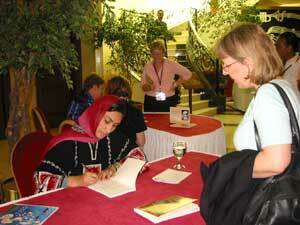 On Friday, the keynote speaker was Ni’mah Ismail Nawwab, who is a Makkan poet and author of The Unfurling. Ms. Nawwab was elated to speak at a TARA conference, since her poetry beginnings can be traced back to TARA in 2000, when she met and heard poet Naomi Shihab Nye speak. Ms. Nawwab is from a scholarly family and was exposed to poetry when her father began reading Shakespeare to her when she was eight years old. Throughout the years, she had always loved poetry but had never seriously composed it, showcasing instead her artistic abilities through photographic and culinary endeavors, along with writing, translating and editing articles, both in Arabic and English. 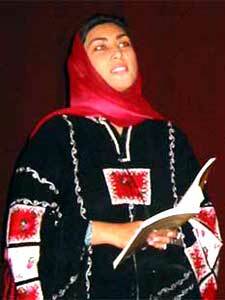 It was through Ms. Nye’s inspiration and encouragement that Ms. Nawwab began her poetry journey, culminating in the publishing of her book in November 2004. Wondering, what is going on behind the mask? Anyone familiar with teenagers could fully appreciate the poem about getting her son ready for Friday prayer. Each person was able to extract the essence of the poem and apply it to their personal life, whether it involved the teen-ager preparing to attend the mosque, a church or a temple. Through the years, Saudi Aramco Schools has supported the TARA conference through volunteerism, human resources and delegates. All proceeds are put towards the next year’s conference, which further illustrates the committee’s dedication to literacy in the Gulf region. For further information about TARA, please visit their website at: www.taraconference.org. To find out more about the International Reading Association, visit www.reading.org.